I’m not sure how I feel about this case…it’s somewhat different that’s for sure! The Sentey SS1-2421 case is part of Sentey’s Slim Series lineup and comes with a 450W SFX12V power supply. 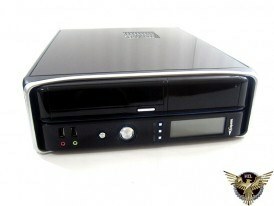 The Sentey SS1-2421 can house a micro-ATX or ITX motherboard, and up to four low profile PCI devices, as an HTPC or an office computer. The front panel LCD on the Sentey SS1-2421 slim tower case features an automatic fan controller, temperature monitor and HDD activity display. The Sentey SS1-2421 has a dark high-quality glossy finish and maintains aesthetic uniformity at the front through the use of a built-in, flip-down optical drive bezel. Designed to be slim and compact, the Sentey SS1-2421 is ideal as an office computer or an HTPC.